Why Studio is the best WordPress Theme for Recording Studios and Music Producers? Designed by Sonaar.io’s world-leading WordPress designer, Studio WordPress Theme is very minimalist, beautiful and efficient WordPress Theme for every recording studios, music producers and record labels. 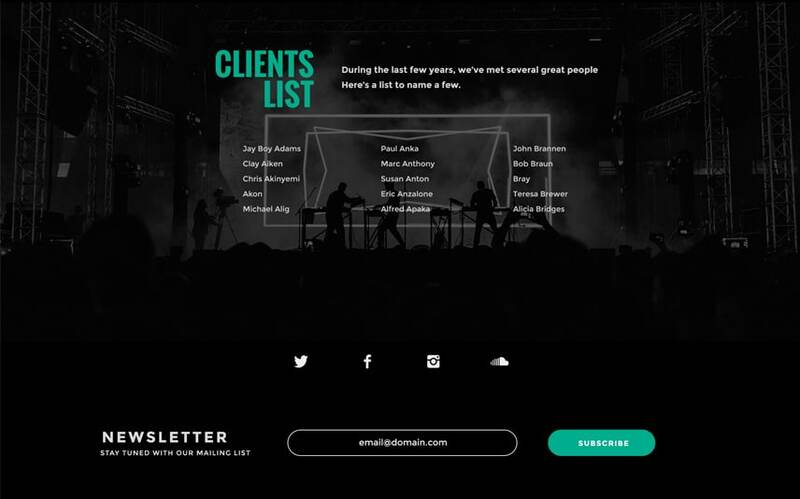 You can promote your services, studios photos and equipment, client lists, portfolios and showcase a catalogue of artists your manage under your label. 100% designed with Elementor Page Builder, it also includes premium plugins Revolution Slider and Essential Grid. 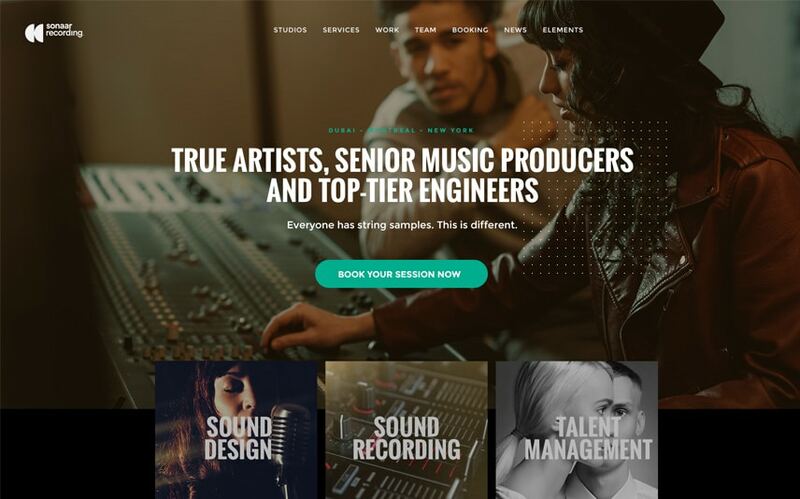 While you can twist the design to suits your unique style, everybody agrees on one aspect: Studio is the Recording Studio WordPress theme of the year for any music producers. Create your website today! Studio WordPress theme is best suitable for any music producers, record labels and music record agency looking to create a stunning website! 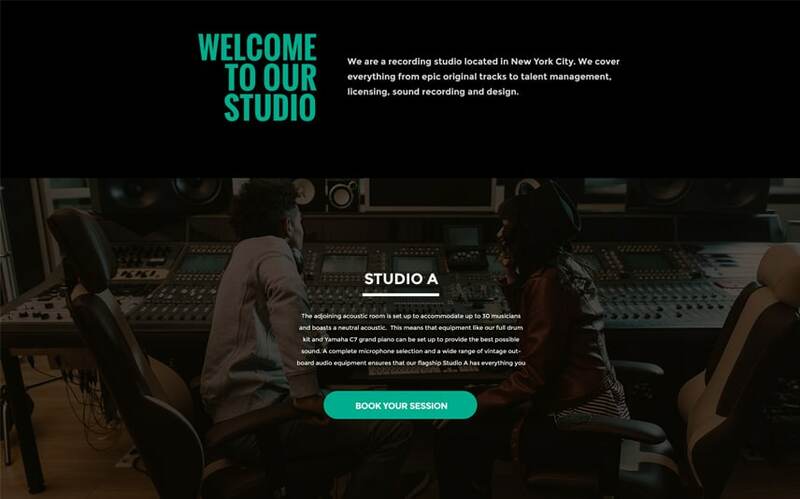 If you are new to the music industry or well-established producer recording music for a long time, our recording studio WordPress theme will impress your next clients. You have the ability to change the logo, fonts and colours as well as the menu items, header and footer through the customizing options and custom widgets. By using the WooCommerce plugin, you will have the option to sell tracks produced by your recording studio music company. Yep. This recording studio website template can be converted into a powerful eCommerce store! Did we forget to mention that it’s fully translatable and multilingual? By using translation plugins for WordPress, you will have the option to translate it to any languages. Say mucho gracias to the Sonaar team and welcome to the family!